The Okanagan Valley is a world-renowned wine touring destination. With over 270 wineries to discover, a guided Okanagan wine tour is the best way to truly discover world-class vineyards and a vibrant selection of local wines. The team at Cheers Okanagan Tours has carefully curated a wide selection of top-tier wine tours. Choose one of our wine tour packages, customize your wine tour, or like a perfectly paired wine, pair your wine tour with various top Okanagan attractions including Myra Canyon, high-octane boating or an unforgettable cruise on Lake Okanagan. Booking a guided wine tour with a reputable Okanagan wine tour company offers wine enthusiasts an unparalleled wine experience. Not convinced yet? Here are our top 5 advantages of booking a guided Okanagan wine tour. The Okanagan Valley offers wine enthusiasts everything from world-class operations to family-run boutique vineyards. These wineries are the ideal place to sip and indulge in wine while soaking in breathtaking views of the mountains and Okanagan Lake. Cheers is dedicated to curating the ultimate Okanagan wine tour for our guests. With that in mind, our team of wine experts has carefully chosen the best vineyards and routes that are perfectly tailored to ensure guests can relax while enjoying the best wine and scenery. 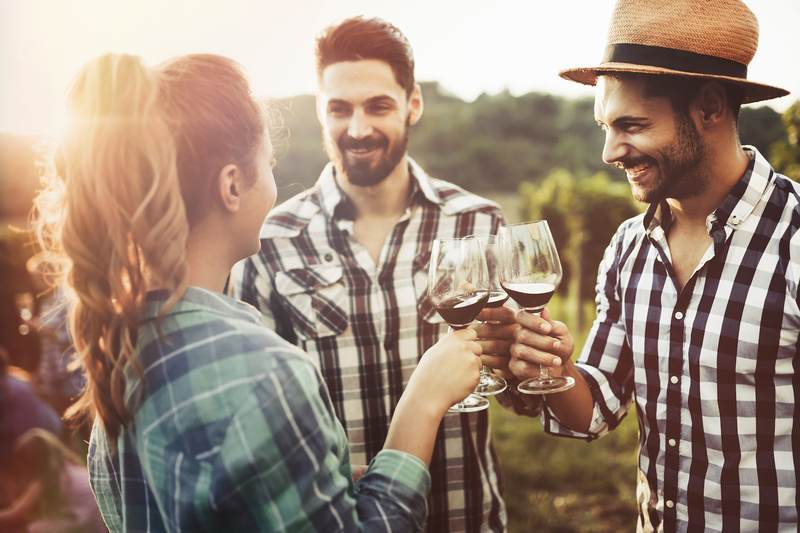 Wine tours provide guests with the opportunity to learn about new wine varietals, the art of winemaking and engage in conversations with the growers and producers. Our welcoming and knowledgeable guides ensure our guests enjoy a unique, fun, informative and memorable experience. We believe the best wine tours should exceed your expectations by providing quality wine varietals, exceptional service, a wealth of knowledge and an unforgettable experience. A wine tour is a perfect place to enhance your knowledge of wine. Learning from expert wine tasters will make your day more interesting and expand your wine preferences. We’re obsessed with customer enthusiasm and our pursuit of being the Okanagan’s most reputable tour service brand. We’ve carefully established a culture that supports our employee-partners empowering them to deliver totally exceptional service and wonderfully unique experiences to our cherished guests. Guests often boast about our friendly, knowledgeable, and enthusiastic employee-partners’ eagerness to provide unparalleled service and an unforgettable experience. Wine tours are the best way to experience top-tier wine tasting and discover new wine varietals you don’t typically enjoy. At each wine tasting session, guests have the perfect opportunity to branch out and try new varietals and expand their palate. Since different vineyards across the Okanagan Valley offer a spectrum of tastes and aromas, it’s important to try several of the same type before forming an opinion. As we taste wine, our palates will constantly develop and change. Tasting a selection of wine varietals is a great way to fall in love with a wine we might otherwise not have tried! Locals and visitors often boast about unparalleled wine tour and tasting experiences. Okanagan’s best wine tours will ensure guests explore hidden gems, boutique wineries, and some of the most awe-inspiring scenery British Columbia has to offer. Discover Canada’s world-renowned wine region with Cheers Okanagan Tours; Kelowna and the Okanagan’s leading wine tour company.